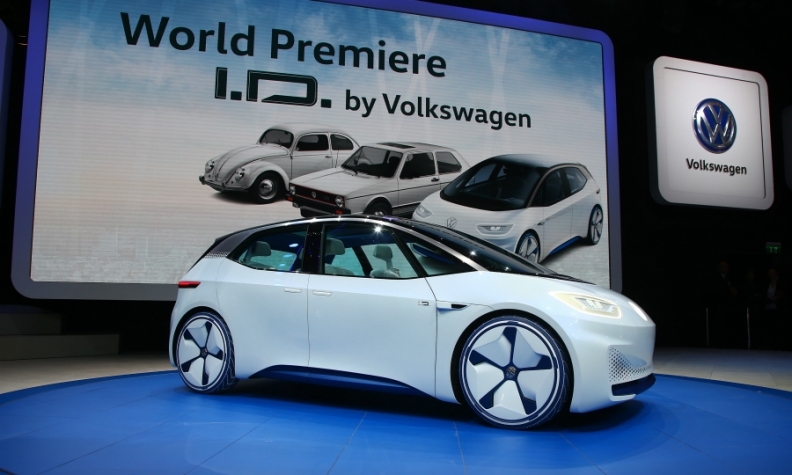 Diess said VW will make its EVs "significantly more profitable than the competition." He is pictured at the brand's annual press conference Thursday. FRANKFURT -- Volkswagen Group's core VW brand raised its midterm target for profit margins and said it would to speed up turnaround efforts as cost cuts help free funds to boost its SUV lineup and develop more hybrid and full-electric cars. The brand will initially develop five all-electric models, taking on Tesla with its coming I.D. vehicle range, it said Thursday at a press conference at its headquarters in Wolfsburg. The push will be aided by rising profit margins, which are now targeted to reach between 4 percent and 5 percent of sales in 2020, up from a previous estimate of at least 4 percent. "We will further accelerate the realignment of Volkswagen, continue the worldwide model and electric offensive and work hard on costs," VW brand chief Herbert Diess said in the statement. "We know which challenges still lie ahead of us." Reviving profit at the core VW marque is vital for the world’s largest automaker to stem the fallout from the diesel-emissions scandal and gather the financial firepower to tackle a seismic industry shift toward battery-powered vehicles and new digital services. The brand accounts for more than half of VW Group's global deliveries and develops key technology for sister nameplates including Audi, Skoda and Seat. The VW brand will invest 22.8 billion euros ($27 billion) over the next 5 years, including some 6 billion euros alone on new technology and electric-car development. A big chunk of these funds will be spent on the planned I.D. range. VW will offer an all-electric hatchback in Europe in 2020 for a price comparable to the diesel version of its bestselling Golf model and follow up with the I.D. Crozz SUV in the U.S. The company plans to sell 100,000 all-electric or hybrid-electric in 2020, Diess told reporters. Volkswagen preference shares advanced 0.8 percent to 178.1 euros at 3:53 p.m. in Frankfurt, on track for their fifth gain in the past six sessions. Investor confidence the company is getting past the diesel crisis has helped the stock recover its losses since the emissions crisis erupted in September 2015. The brand expects record sales of "significantly more than 6 million cars" this year, it said, exceeding last year's record 5.99 million VW brand auto sales in 2017. The brand is counting on strong momentum in China, Europe and the U.S.
To generate funds needed to finance electric-car development, VW will widen its lineup of lucrative SUVs to 20 models by 2020 and expects those vehicles to account for 40 percent of sales volume by then from 14 percent now. The redesigned Touareg and an all-new T-Cross are due to hit dealerships in 2018. It will introduce more than 10 fully or partly battery-powered cars in China in the same timeframe. 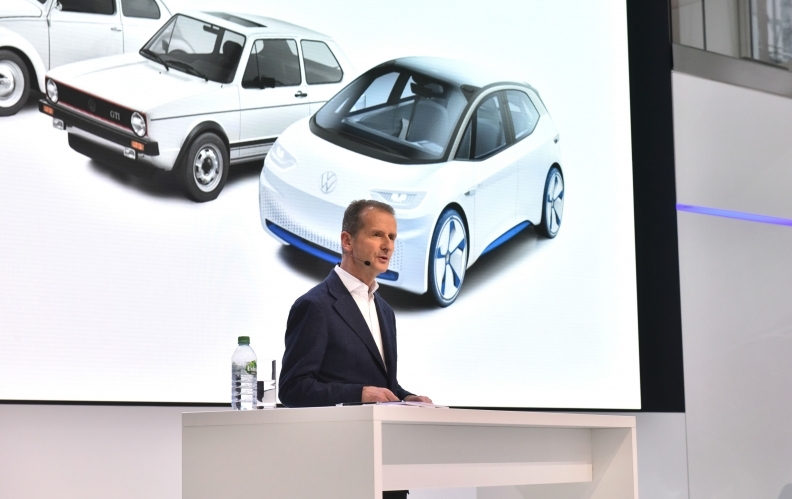 While other car manufacturers face heavy losses from electric-car efforts, VW’s new range will "help secure margin targets," Diess said. "Through high-scale effects and a cost-optimized platform we’ll make our electric cars significantly more profitable than the competition," Diess said in a speech. VW brand will launch its first standalone EV will be based on the I.D. concept (shown) in 2020. VW aims to dethrone Tesla and become the leader in electric cars by selling 1 million purely battery-powered vehicles worldwide by 2025, according to previous statements. Tesla's inroads into more affordable market segments with the Model 3 have been hit by production snags as the California company continues to burn through cash. VW signed a landmark labor deal a year ago that has already contributed 1.9 billion euros in savings. The company is making its vehicle manufacturing less complex and will cut 14,000 jobs, mainly through partial retirement. The cutbacks are part of a bid to boost productivity at VW’s high-cost German factories by 25 percent by 2020. VW reached the 7.5 percent productivity improvement goal for this year "in large parts," it said on Thursday. VW has also axed slow-selling models like the flopped Phaeton, the Scirocco and the three-door version of the small Polo hatchback and accelerated development of SUVs to increase its presence in this lucrative and fast-growing market segment, where it has lagged behind rivals for years. A month ago the brand slightly raised its ultra-conservative margin goal excluding special items for this year and now expects to "moderately exceed" its target corridor of between 2.5 percent and 3.5 percent. Operating profit as a proportion of revenue stood at 4.3 percent after the first nine months. Global deliveries rose more than 3 percent to 5.04 million cars in the first 10 months of the year, helped by robust demand in the brand’s largest market, China. Diess acknowledged that VW’s recent recovery has been helped by a robust general economic environment. “There’s no guarantee that this will continue,” he said.